Robert Fuhrman assumed the post of Museum Coordinator & Historic Preservationist for the City of Dickinson in 2017. 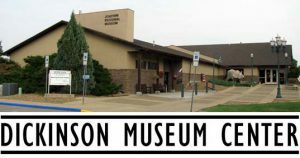 Prior to coming to Dickinson Bob served ten years as Executive Director of the Richard I. Bong Veterans Historical Center in Superior, Wisconsin. He has also served as CEO of the Clark County (Ohio) Historical Society, and Executive Director of the Kenosha County (Wisconsin) Historical Society and the Mercer County (Pennsylvania) Historical Society, beginning his first directorship in Mercer in 1990. His first professional position was as Assistant Curator of Research Collections at the Milwaukee County Historical Society. Bob has served on the Mercer County Courthouse Restoration Committee, the City of Kenosha’s Historic Preservation Commission, and on grant review panels for the Pennsylvania Historical & Museum Commission and the Milwaukee Foundation. He has presented at the Smithsonian Institute’s Mutual Concerns of Air and Space Museums annual conference. He is the author of Hail Temple Built to Justice (1994) and “The 57th Pennsylvania Volunteer infantry at Gettysburg” (Gettysburg Magazine, 1997). A native of Wisconsin, Bob graduated from the University of Wisconsin-Oshkosh with a degree in History and Sociology. His Master’s degree in Public History with Certification in Museum Studies is from the University of Wisconsin-Milwaukee and the Milwaukee Public Museum. Bob resides in Dickinson with his wife Barb.